Martial Arts Judo Taekwondo Karate Lynx Trophy Award " FREE ENGRAVING"
Manufactured from 40mm solid beech and jade glass effect perspex. This stunning golf trophy is designed and made by us. Wood is engraved with a golf ball as standard. Complete with stand. We aim to engrave and dispatch your order within 24hrs. Medal Rugby Trophy Bronze 3.5in Red Velvet Box And FREE Engraving. Red Velvet Box And Medal Golf Trophy Bronze 3.5in FREE Engraving. A Footballer on a marble base gold incolour. 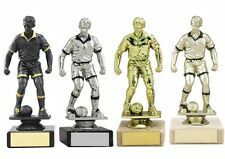 Bronze/Gold Resin Football Mini Star Trophy (1in Centre) 4.25in 1in Centre - Resin Trophy Size: 108mm. Grey/Silver Glass Plaque With Cricket Insert Trophy 6.5in Complete - Glass Trophy Size: 165mm. YOU CHOOSE YOUR COLOUR. You can choose any colour from Snow White. Bronze/Gold Rugby Curved Plaque Trophy - (1in Centre) 6.75in 1in Centre - Resin Trophy Size: 171MM. Man of the Match Football Trophy Mini Cup Award with FREE Football Incert - 3.75in. Quality Rugby Trophy. How do I personalise my trophy?. Table Tennis Trophy Award Prize Gift 3 sizes available "FREE ENGRAVING"
Bronze/Gold/Gold Rugby Ball And Boot Chunky Flatback Trophy Award (1in Centre) - 4.25in 108MM Approximate Size 1in Centre - Resin Trophy New for 2018. 1 x RF16085A 170mm Typhoon Goalkeeper Award including Football centre and engraved plate. Rosewood Box And Medal Golf Trophy Bronze 3.75in FREE Engraving. High Quality 'Venture' Golden Boot Football Trophy. How do I personalise my trophy?. Height: 8" (20cm). Set of 2 Kick Boxing Resin Trophies. Great quality and room for engraving of your choice. FREE engraving. Silver/Black Football Swirl Column Trophy Award (1in Centre) - 10.75in 273MM Approximate Size 1in Centre - Trophy New for 2018.